We are pleased to introduce you to the members of our Fjord herd! Our herd of Fjord horses usually numbers between six and twelve individuals. Besides Mogly and our core group of mares, we generally have a few young horses we are bringing along, and some sales prospects in the works. The details of each horse can be seen by clicking on their name below. Kestrel is a home-bred mare, foaled in 2000, sired by Felix (imported from Norway) out of Roza (imported from Holland). 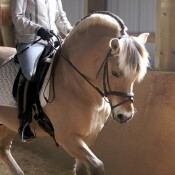 Her dam sire is Fjelljon, born in Norway and standing in Holland where he earned the rank of Elite stallion. There are only two Fjelljon daughters in North America, and the other one (somewhat curiously) is also called Roza. Our Roza was out of a Bjorgard daughter called Lisa. This is quite an impressive dam line, with Roza’s dam, grand-dam, and great-grand-dam all being ster mares. Bjorgard himself was sired by the great Astrix and out of the Elite mare Sunngard. 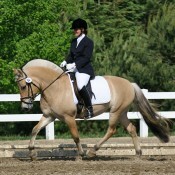 Kestrel was trained in dressage with Lori, and shown successfully. At her first show, the National Spring into Dressage at Palgrave, she won a Championship at Training Level, scoring as high as 71.36%. To see some of the horses that we have bred, raised, trained, and sold, visit our Sold Horses page.